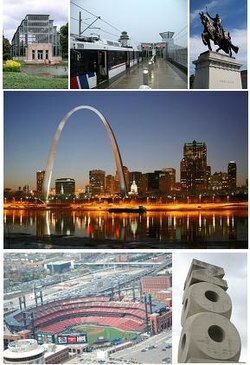 St. Louis (pronounced /seɪnt ˈluːɪs/ (deprecatit template) or /sænt ˈluː.iː/; French: Saint-Louis or St-Louis, [sɛ̃ lwi] ( listen)) is an independent ceety an the seicont-lairgest ceety in the U.S. state o Missouri. In 2010, St. Louis haed a population o 319,294; a 2013 estimate put the population at 318,416, The principal municipality o Greater St. Louis, population 2,892,874, the lairgest urban aurie in Missouri, the 4t lairgest urban aurie in the Midwast, an 15t-lairgest in the Unitit States. St. Louis haes 16 sister ceeties. Wi informal relations wi Tuguegarao, Philippines. ↑ 5.0 5.1 "State & County QuickFacts". United States Census Bureau. Retrieved September 14, 2013. ↑ "Population Estimates". United States Census Bureau. Retrieved 2015-03-27. Wikimedia Commons haes media relatit tae St. Louis. This page wis last eeditit on 7 Dizember 2018, at 22:41.